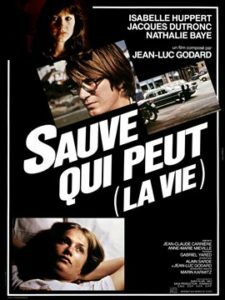 After a period of making aggressively experimental films and becoming isolated (his own word for it), Jean-Luc Godard returned to making widely shown and distributed films with Sauve qui peut (la vie) (released in the USA under the title “Every Man for Himself”). Decades later, other works like Film Socialisme were still resembling this film. That makes Sauve qui peut a landmark within Godard’s career. The composer Karlkheinz Stockhausen has spoken (Musical Forming: Composing Statistically (1971)) about how “if you are able to compress an entire Beethoven symphony into half a second, then you have a new sound, and its inner microstructure has been composed by Beethoven.” It would not sound like a symphony, but to human perception would resemble a single tone with a particular timbre. The individual elements surpass a group, and completely different relationships begin. Godard is concerned with the cinematic equivalent of that issue of the temporal limits of human perception — though tending toward expansion rather than the compression Stockhausen discussed (and maybe akin to key parts of Blow-Up). A technique he had developed working with videotape for a television mini-series shortly before making Sauve qui peut had him deploying slow motion effects. He applies a version of that to film here. 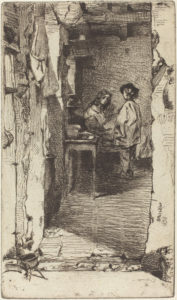 One scene has two of the main characters fighting in a kitchen, and Godard said he decided to show the incident in slow motion to reveal meaning that would not be perceptible at regular speed. He wanted to show that as they physically fight and fall to the ground — what would happen in an instant in real time — the characters maybe still love each other, something that viewers tend to contemplate as the characters are held in contact as they fall. Godard biographer Colin MacCabe wrote that men become film directors to meet women, and that quip at one time seemed to accurately describe Jean-Luc Godard, in his early career, but that phase was a distant memory by the the time of his “Second Debut” Sauve qui peut (la vie). There are strong feminist themes here. Though Godard emphasized in interviews in this era how a key preoccupation of the film was with workers and their work. 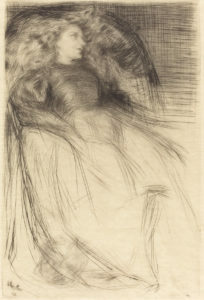 The absurdities, degradation, and obstacles bound up in working are sublimely stylized and symbolized in scene after scene — many of which ponder questions around privilege, exploitation and self-identity. In the decades immediately following the film’s release, these aspects of work have not changed but perhaps only intensified, making Godard’s oblique insights of what might have been passing sociopolitical circumstance still seem compelling and relevant. Godard’s films might be many things, but they are certainly not lacking for starkly original images. This one is a bit more grounded than some of his early films, in that the romanticism and cinephilia is less pronounced, and in place a more nuanced view of the travails of “ordinary” life. This is yet another astounding film from one of cinema’s truly great and visionary figures. Count this as essential viewing for his admirers. Best known for his fluke 1988 mega-hit “Don’t Worry, Be Happy!,” Bobby McFerrin had before that managed to establish himself as a very singular vocalist. He was obviously working from a jazz tradition, of sorts, but he also weaved in a lot of pop sensibilities and pure showmanship. But it is worth putting this album in a historical context. Individualism had become a dominant conceptual framework by the mid-1980s. This is to say that there were political overtones to the promotion of individualism and privatization of formerly public goods/values. Discussing the rise and fall of political — and specifically presidential — regimes, Corey Robin has identified the “Reagan Republican regime, which began in 1980” as one that managed to defeat the labor movement (which rose from the New Deal), the Black Freedom movement, and feminism. An album of solo virtuoso performance (while not unprecedented; see, for example, any number of solo jazz piano albums, or vibraphonist Gary Burton‘s Alone At Last) fit perfectly within such a paradigm, at least in the sense of framing an argument within the parameters of that social and political climate. So McFerrin’s music (and the hit “Don’t Worry, Be Happy!” kind of fits this political program as well), perhaps unintentionally, or at least not consciously, was bound up in the politics of its time. Sonny Sharrock‘s solo Guitar album also deserves mention in the same way. It is that same sort of “exceptionalism” that lurks in the background of McFerrin’s album The Voice, the relentless displays of virtuoso singing, which conveniently supports the ruling class narrative that success (or failure) is premised entirely upon individual initiative, and that there are no (or no longer) any structural impediments like racism or sexism or class-base antagonisms worthy of discussion. If all this seems removed from the music of The Voice, it shouldn’t. There is evidence that this style of music served the ruling class, and that the ruling class recognized as much. When future U.S. President George H.W. Bush (a Republican) used “Don’t Worry, Be Happy!” as his official campaign song for the 1988 election, McFerrin protested (indicating he was a Democrat). Bush, of course, was Reagan’s Vice-President, and a part of the Regan Regime. While there was a time, during the Jim Crow Era, when jazz musicians like Louis Armstrong and Charlie Parker could make an (implicit) political statement by demonstrating virtuosity, by the 1980s the sociopolitical backdrop rendered such exercises problematic, in the sense that they no longer supported black liberation, but were congruent with the positions of those opposed to black liberation. Indeed, the largely concert-hall audiences for McFerrin’s performances on this album suggest almost a kind of de-politicized, collaborationist agenda, the sort that led Frantz Fanon to write, “What matters is not so much the color of your skin as the power you serve and the millions you betray.” Black Skin, White Masks. In the coming years McFerrin would sing a version of the theme song to the disgraced comedian Bill Cosby‘s hit TV show, “The Cosby Show,” and Cosby was somewhat notorious for advocating a neoliberal form of multiculturalism that preached personal responsibility as both the necessary and sufficient causal factors for the material circumstances of poor minorities. He also would go on to work for a Chamber Orchestra, the sort of organization that is a haven for the rich and self-styled aristocrats (and wanna-bes). If all this makes McFerrin’s music seem problematic, it should only do so in a certain context. The music itself, heard in a proverbial vacuum, is wonderful. But its success was due, in part, to its proximity to the dictates of the ruling ideology of the day. Sonny Sharrock’s album Guitar had, on its surface, all the same traits: individual solo performance (albeit with overdubs), virtuoso technique, etc. But Sharrock went for a completely different tone. His album had a dreamy, almost mystically searching quality, with a pervasive sense of hopefulness and longing. 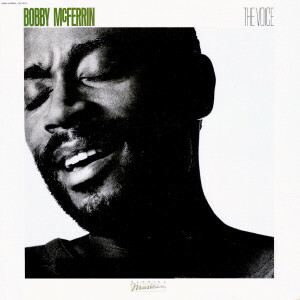 McFerrin’s The Voice, in contrast, features songs that mostly trade in hedonistic pursuits, and the occasional retro triumphalism (his use of James Brown’s “I Feel Good” is both a dose of hedonism and an assertion that the civil rights movement is over and was won, not an ongoing struggle or even mostly a loss). Take also Rahzel, the hip-hop vocalist/beatboxer who kind of took McFerrin’s vocal approach a step further (just check out “If Your Mother Only Knew”), but who also made music that was far less compatible with mainstream tastes (and ruling ideology), due to his focus on the characteristics of a more lower-class lifestyle. So, The Voice deserves a place among the finest jazz albums of its decade. Yet, it should also be consciously associated with the conservative (centrist [neo]liberal) strain of jazz music of the time (ref. Wynton Marsalis). That shouldn’t take away from what it achieves in purely artistic terms, but it should contextualize those achievements, and, more importantly, explain McFerrin’s success as being dependent upon much more than the purely artistic elements of this album or his other work. Vicenç Navarro – Is The Nation-State And Its Welfare State Dead? 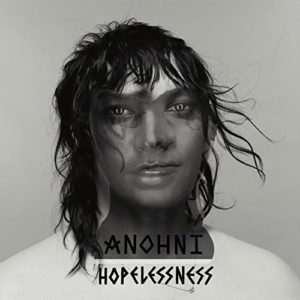 ANOHNI’s (formerly Antony Hegarty) solo debut is a resolutely political work inhabiting a space not unlike P.J. Harvey‘s The Hope Six Demolition Project, with many of the same pluses and minuses. Harvey’s album railed with righteous indignation against the Tories and the cold, heartless class war they are waging in England. ANOHNI is from the U.S. and her focus is instead located there. And both deliver blunt, progressive political messages in ways that don’t seem particularly musical, in the sense that the musical backdrops in each case seem almost ready-made and conservative. Hopelessness combines familiar glitchy electronica while the vocals invoke the catastrophes of the contemporary world. “Drone Bomb Me” and “Obama” are direct indictments of murderous wars of aggression and the depraved madness of the political servants of the ruling class. “Four Degrees” is a stark testament of complicity in the environmental destruction of the anthropocene era. This is a juxtaposition of poppy beats, with all the implied escapism and feel-good utility, with grave and discomforting texts, with all their heavy political weight. It is an awkward juxtaposition, and meant to be such. This music is an overt attempt to rattle listeners out of the complacent acceptance of the status quo — to make them confront the banality of evil in their lives. All this may well be true, but is Hoplessness effective? That may be an impossible question to speculate on, but suffice it to say this is a difficult listening experience meant to make the listener uncomfortable. And the problem is the very conceptual nature of the album — often a bit too binary and simplistic and even formulaic (a problem generally avoided by the likes of, say, Laurie Anderson). There should be few doubts about ANOHNI’s good intentions, but those intentions only go so far. Perhaps that’s even the wrong way to put it. The intentions of this album are inescapable, like being confronted by someone doing political canvassing, and often Hoplessness is no more artistically memorable.